A comedy disc now. From (I think) Comedians from Aussie radio. Every time i see someones 78 collection I always come across several of these. It must have been the "must have" disc in the early 40's. Although some comedy from the 40's does suffer with age some of the material here is surprisingly fresh! I also have the Coronation edition and Here's Hooey 2 as well for those interested and they are also on the 12 inch type of 78. There is no "fake stereo" version of this as there was no point! 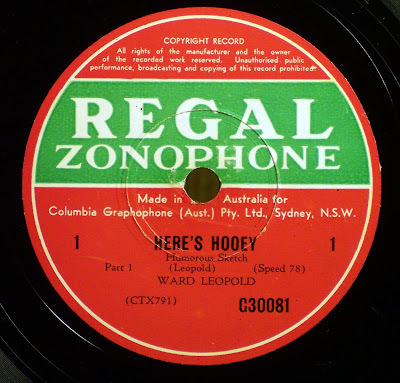 Ward Leopold was on radio and 'Here's Hooey' was his send up of the way radio worked. He was banned for a long time as radio did not have a sense of humour at the time. I too have the 3 in my collection, a bit of fun. Hi, I'm Ward Leopold's daughter and would love to find some of his work so my adult children can here it for the first time. I'm not sure he was actually banned in the radio world though. I have never heard this as I grew up. He was a very versatile and clever man. His fame was huge un N.Z. and really well loved here in Australia. There is a lot more material Dad wrote. There were at least 10 records and he also composed a lot of music. Lovely finding he's on the internet, he would be amazed! I believe that I have the only 33RPM record with all 4 of the "Here's Hooey" tracks on it. Wow thanks Anom for your comment. Ive restored 3 of the 'Here's Hooey" 78's"
was there 4!! that's a surprise! get in contact with me if you want a "proper" Re-master. Im sure we could "work something out"
This fine comedy DESERVES to be heard! Yep, there were 4 tracks ranging from the mid 40s until 1953. 1 X 33and 1/3 rpm Here's Hooey original. This record is still in very good condition and I'm open to offers if anybody wishes to buy it. I'm in Newcastle and postage can be arranged. Jake can you email me please? Im not a "rich" man but in the interest of getting these recordings out there for a new generation Id like to talk some more about obtaining the disc! "Baseface The Ace Of Space"
There is also a 7" 45rpm EP disc on Columbia SEGO 70051 called THE "IT" PARADE with Moya O'Sullivan, Judy Farr. John Tait. Ted Husband. & Max Obiston. Music by George English. It is intended as a send-up of television commercials with many barely disguised product names.